If you, like us, were wondering how SockScene knit up, we are pleased to be able to provide the answer. 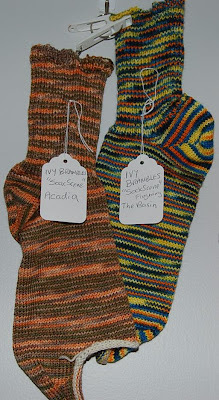 We have a couple of socks on display at "The Yarn and Fiber Company" knit in Ivy's colorways "Acadia" and "The Basin", left to right respectively. The Yarn and Fiber Company currently carry 19 of our SockScene colorways, although some are now on backorder due to the high demand. We hope to fill these within a few days as we add more yarn types and weights.